Remember those days of skipping class to play this?, Oh man, those we're good old-school days. The early-mid 90's was the dawn of the Neo-Geo era and its debut on the arcades. SNK's 330 Mega Pro-Gear Spec behemoth was ready to prove it had what it takes to be the self-proclaimed "Super High Tech Game" and take the challenge of hardwares such as Capcom's CPS2 or the Systems 16 and 32 from SEGA. While the Neo-Geo is mostly remembered as a heaven for fighting game enthusiasts (The King of Fighters, Fatal Fury, Art of Fighting, Samurai Shodown, Rage of the Dragons and The Last Blade), there was other genres too, and shooting was among them. Although they're in a smaller number they're pretty much successful: Andro Dunos, Alpha Mission II Last Guardian, ZedBlade, Pulstar and the 1998 smash Blazing Star. However, another shmup was about to arrive, and that was the sequel of Video System's vertical smash hit: Aero Fighters (or Sonic Wings as it was known in Japan). "Bigger, Badder, Better" was the tagline. 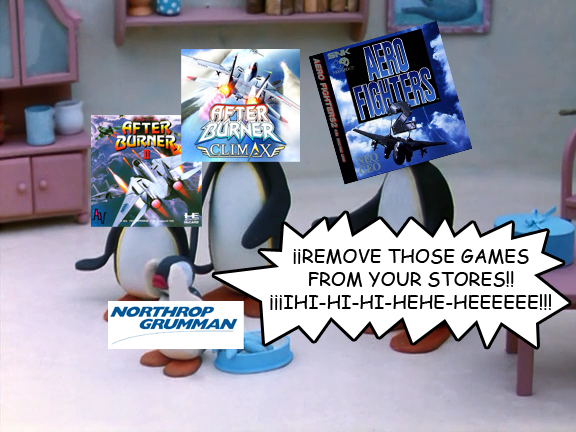 But it was more than a tagline, it was the Zen and Philosophy of the Neo-Geo and apparently Video System put that in practice on Aero Fighters 2. The ACA Neo-Geo series have four main features. Original Mode "Japanese Version", Original Mode "English version", Hi-Score Mode and Caravan Mode (I'll explain the last two later in this review). The Original Mode is the arcade game that you've played on your after-school days and weekends. You can play either the Japanese version or the English version of a game. At first, the game looks quite the same as its predecessor, however there's some new faces along with your ol' Aero Fighters buddies. Like in the first game, you can select a country which is represented by a specific aircraft, but this time you don't have 1, but two planes per country. Lockheed (Now Lockheed Martin) F-117 Nighthawk: Piloted by Robo-Keaton. At the end of Aero Fighters, Blaster Keaton and his F-18 were blasted out of Earth's orbit, sending him away to the stars on pure "Team Rocket is Blasting Off Again" style (or simply burnt in the atmosphere due to a fast re-entry in the SNES version), which resulted in his body to be horribly damaged, and he was reconstructed and resurrected in this RoboCop spoof. His F-117 features a rapid fire series of twin lasers known as Needle Lasers which became a multiple stream increasing its width as a full-straight shot, the Hornet's Snake Napalm is back and better than before, increasing further damage. However, having a fast-fire has its flaw and that's a low damage rate. For his special attack, Robo-Keaton replaces his F.A.E. (Fuel Air Explosive) bomb for the Satellite Laser, which fires a V-Shaped laser wave that leaves an explosion filled screen. Fairchild Republic (Now part of Northrop Grumman) A-10 Thunderbolt II: Piloted by Captain Silver and his parrot Polly (sometimes called "Pally", in Sonic Wings 2 its name is Flint), replacing Keith Bishop and his F-14 as Keaton's teammate. This "Retired Top gun" returns from his retirement to avenge his friend Randy. The A-10 has a strong firepower, even it's "Level 1" single shots are quite too strong compared with the other planes. The A-10's laser vulcan shots are accompanied by fast Cluster Bombs which leaves a blue explosion that affects other enemies within its radius. Its special attack is the "Pinpoint Bomb", a double F.A.E. bomb drop that merges into a large explosion, which works like Keaton's F/A-18 F.A.E. Bomb While its firepower can be amazing, it has a flaw: It is the slowest jet in the game. Seems like the A-10 is cursed to have flaws in shmups: Slow in this game and in Vapor Trail (as the XAV-02 Valkyrie), and it's low power level in the SNES port of U.N. Squadron. Mitsubishi/General Dynamics FS-X: The ninja-pilot Hien (Spelled Hi-en in this game) returns to the action. The FS-X's fires Kunai Shots accompanied by Homing Shurikens. His special weapon, the Ninja Beam is back as the devastating "Death Beam" that annihilates anything infront of it. McDonnell-Douglas (now Boeing) F-15 Eagle: The Supersonic Idol Star Mao-Mao is back again as the F-15 pilot, however, she changed her military-themed costume for a more idol-like attire. Her F-15 shots fire a Twin-blast in a "\ /" pattern, which requires getting close to some enemies to get them hit by both streams. Her shots are followed by thin green laser pulses called Gull Laser which act as a Wave-shot. Her special weapon is the same as in the first Aero Fighters: The E-Wave which paralyses all enemies and bosses on screen. Grumman (now Northrop Grumman) F-14 Tomcat: The F-14 returns, but not piloted by Keaton's buddy Keith. Instead it is piloted by the multi-millionaire woman Ellen and her daughter Cindy (Cincia in Sonic Wings 2) who acts as her RIO (Radar Intercept Officer) forming an unique mother and daughter team. The F-14's main shot is the Vulcan Shot from Keaton's F-18 but instead of the Snake Napalm, it carries the homing AIM-54 Phoenix missiles from Keith's F-14. Their special attack is the "Support Missile" a Cluster Bomb Drop similar to the Avro Vulcan "Supporting Bomber" from Villiam's Harrier, but the F-14 version is released by huge missiles, replacing the background pelting Tomahawk from Keith's Tomcat. Northrop/McDonnell-Douglas YF-23 Black Widow: This experimental stealth fighter is piloted by the dolphin Spanky (or "Whity" in the Sonic Wings 2 version), who joins the Aero Fighters team to protect the world's environment. His YF-23 fires twin orbs of energy along with Float Mines which deliever moderate damages. Unlike Tee-Bee's JAS-39 Float Mines from the first Aero Fighters, the player can push them towards his enemies, although this can be tricky and most of the times impossible against small and fast enemies. Its special attack is the Web Beam, which fires an Energy Wave that splits in two directions like the "Line" bomb from Super Turrican. Dassault Rafale-M: The Aero Fighters have a new singer-pilot, this time is Steve (or Anjera/Angela in the Sonic Wings 2 version), an androgynous punk-rocker which is also the first LGBT character in shmup history. A message that no matter our gender and orientation, we are all one and the same during the battle against evil. His Rafale-M features the Needle Shot from Keith's Tomcat, resulting in a quite strong shot like it was in the first Aero Fighters. Its firepower is supported by the Metal Storm, but unlike Kohful's AJ-37's Metal Storm, the Rafale version shoots fast paced missiles that follows a spread pattern, but its one missile "per direction", that means 1 straight, 1 to the left, 1 to the right, etc. His special attack is the Gravity Bomb, dropping a circular Energy Field or Black Hole that damages enemies within its radius. British Aerospace Sea Harrier FRS.2: To finish the fantasy element, the Harrier is piloted by a baby named Bobby (Arthur in Sonic Wings 2). He is the son of Villiam Sid Pride, the Harrier pilot from the first Aero Fighters. Bobby's Harrier has the Wide Gatling as its main shot, a basic three way shot that is backed up by the Maverick Missiles. The Air-to-Ground Missile AGM-65 has a "Semi-Homing" function, at first it looks to go forward but then it leans to nearby enemies. Think of them as the predecessor of the New Homing Missiles from Raiden III and Raiden IV. The Harrier's Special Attack is a twin Napalm Bomb that aims in double diagonal directions but dealing devastating damages. Gameplay is pretty much the same as its predecessor, specially if you play it in 1 Player, the gameplay mechanics hasn't changed too much. Starting with the items. The "P" item gives you a Power Up, "B" adds an extra Bomb and the "F" item is your Full Power Up that appears everytime you continue the game. The "Money" bonus items are back like before, but here's the new twist in this game: To obtain the highest bonus points (10,000 to be exact) you have to destroy the enemy/building/structure as soon as it appears, the more on the top of the screen its destroyed and stays the shortest time possible between being revealed and before you pick it, the bigger the bonus, being 10,000 as the highest and 200 the lowest. Obtaining the most 10,000 per item possible requires memorization on where are the enemies and structures that carry the items. The game's length was also increased from having 7 stages to 10. Like in the first Aero Fighters, the game loops 1 more time for a total of 20 stages. To enlarge the stages length, they included two bonus stages where you destroy multiple enemy formations and missiles that drop power ups to increase your strength and give you bonus points. Continuing in this game was vastly improved. Unlike the first game where your score is resetted, you'll keep your score but 1 point will be added each time you continue the game. But when the game is played in 2 Player mode, things are much more different. 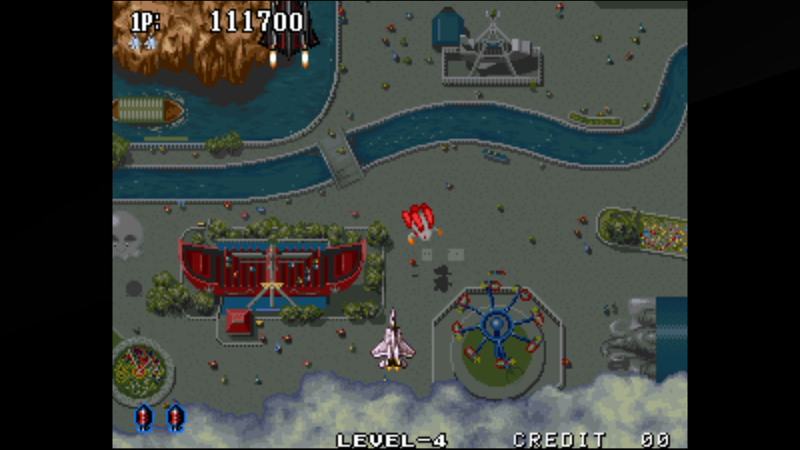 The main feature of this game is the "Free Selection" as both players are no longer forced to play as a "Country team" like in the first game, so this leads to multiple combinations which result in an incredible total of 39 endings, enhancing the replay value much further than the first Aero Fighters. An interesting feature is the "Interrupt Save Data" feature which kinda works like a "Save State" from emulators such as ZSNES or Gens32, but i guess they're trying to emulate the Memory Card Load from the Neo-Geo. Back then, when the Neo-Geo arrived, it did it in two forms: The Multi-Video System or MVS which we saw on the arcades and the Home System, which was the console. What i've readed in emulation sites is that the Home System had a Memory Card which was used to save the game data and use it to load the game in an fully equiped MVS cabinet, allowing the player to resume his/her gaming session in the Arcade, which was a revolutionary feature for the time being. Apparently, SNK was ahead of its time during the Neo-Geo era. "Caravan Mode" is a 5-minuted timed game, the main purpose of this mode is to reach the highest score possible within the time limit. Old school shooter enthusiasts will find it very familiar, "Feels like Hudson Soft" right?, Star Soldier and Starship Hector players will recognize this as the good old "5-Minute Mode". However there's a curious flaw in this game. If you pause the game it doesn't give you the option of returning back where you paused it, only giving you the option of restart the whole game or returning to the Main Menu. In some aspects it adresses one of the flaws of timed based games such as Star Soldier: Vanishing Earth where the time was running even when the game was paused. However if the player dies there's no continues and the game resets. "Hi-Score Mode" is your Score Attack mode where you compete with other users scores to see who is the best. like in Caravan Mode, there's no continues if you get Game Over. Also, you can not use the Turbo button function from the original mode, so in one way it's arcade faithful, but blended with some Arrange Mode-esque elements, mostly the lack of continuing like in Ibara and Triggerheart Exelica. 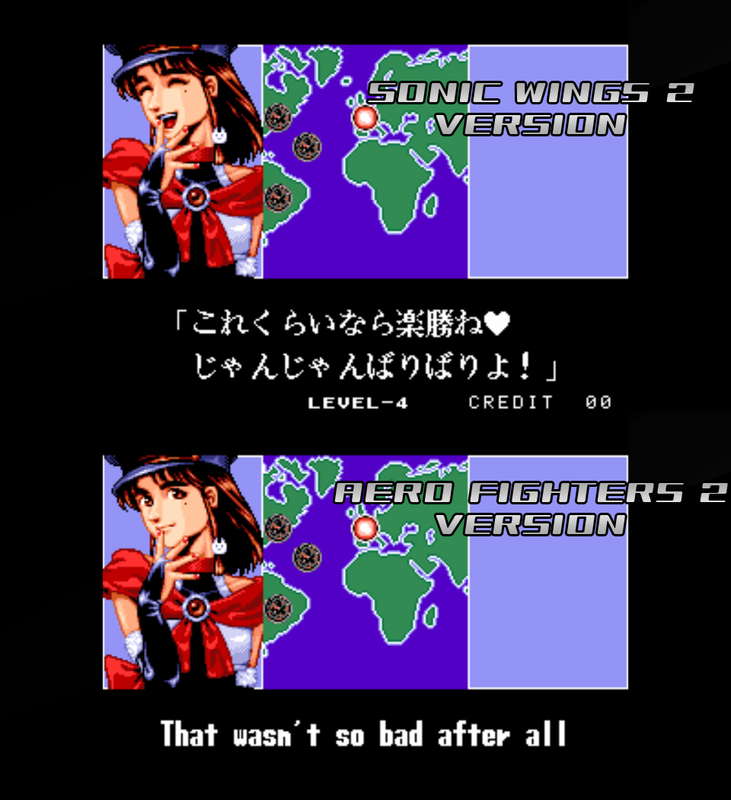 The curious thing of all is that both Caravan and Hi-Score modes are played on the Aero Fighters 2 instead of giving the option of play it in the japanese Sonic Wings 2. To complete the Neo-Geo MVS experience, the game gives you the option of adjust settings such as starting lives, difficulty level and if you want extra lives at 200,000 or 300,000 points along with resetting the high scores and even screen adjustments to recreate the cabinet screen. Before talking about the game's graphics, i wanna talk about the menu and lack of an opening sequence. I know it's an old Neo-Geo game, but even compilations had better main menus or even animated introductions such as Taito Legends 2, Megaman X Collection, Activision Anthology and recently Megaman Legacy Collection. Unfortunately, this simply detailed menu issue is not only for Aero Fighters 2, its for all the ACA Neo-Geo titles. I'm no marketing genius, but making a more detailed menu makes the whole thing more presentable and attractive to the audience? You know, that in twenty years or more, you still look the same as you do today. You'll still be a young girl, when I'm old and grey. As for the game's graphics. The Neo-Geo really made wonders in this game. A 4096 color palette brings a brighter, vibrant and alive enviroment not just for background, but for all the game sprites. It was interesting to see how Players 1 and 2 are no longer the "One is grey and the other orange" from the first Aero Fighters, allowing a more realistic coloring on all aircraft (the camo pattern on the A-10 for example). Also, one of the strengths of the Neo-Geo hardware was the major amount of detailing on large objects like bosses and scenario, but also improving the character portraits. Curiously, the japanese Sonic Wings 2 features different expressions on the character portrait on the in-between screens after completing a level, something that was removed from the american and european versions for no specific reason. Speaking of region differences, something that i've noticed from the English version is that some contents weren't removed due to present day circumstances for this re-release, specially the destructible Twin Towers and the Empire State Building in the New York stage, which could be disturbing for some audiences. So we can call the English version as "Uncensored and Uncut". Like in the previous game, the military is the dominant theme in the ship and enemy design, however the fantasy and anime elements are added in the game from the cast of pilots and the random final bosses which blends anime (Lar) and comical material (the fish Manbou and Tenuki). The sound was also improved by SNK's new hardware. With 7 digital and 8 FM channels, the result is a game with very involving, high-fidelity, CD quality sound, very advanced for the early 90's and for the Neo-Geo's first steps. The game's soundtrack involves different rhythms according to the respective stages like traditional japanese drums for Stage 1 and tribal drums for the Amazon stage for example, but there's one flaw: The stages can be too short so we can't enjoy the music long enough because one minute and a half of starting a level, the boss theme is already playing. - ACA stands for "Arcade Archives", as AC is referred to the Arcade Cabinets. - Neo-Geo means "New World" in latin. - The 330 Megas of the Neo-Geo are measured in megabits (Mb for short), in Megabytes it will be 41MB (8 Megabits = 1 Megabyte). - Aero Fighters 2 used 102 of the 330 Megas, a total of 12MB. - This was the first Aero Fighters / Sonic Wings title released on the Neo-Geo MVS hardware. - It is also the first in the series to be released in US by Video System itself via SNK Corp. of America, discarding the need of distribute it via Mc O'River. - The cover of the Neo-Geo Home System and Neo-Geo CD versions advertises this game as "Real Shooting Game". - It's the only entry in the series with a free-selection 2 Player mode and massive Multi-Ending features. - The location of Stage 10, "Another Dimension" is in outer space, as Cindy says "I've never been in space". - Ellen and Cindy were originally from the arcade racing game Lethal Crash Race / Bakuretsu Crash Race. They appeared as the Lamborghini Diablo drivers. - Another Lethal Crash Race cameo can be found on the Cindy/Ellen-Robo Keaton ending, the former Lotus Super 77 driver Emma appears as the mechanic who refuels Robo Keaton. - The last random boss, Tenuki originally appeared in Rabio Lepus / Rabbit Punch. As a nod to this game, the boss will trigger a carrot drop once he's destroyed. - Another Rabio Lepus cameo can be found in the New York stage, as Rabio and Tenuki appear as decoration on the park. - There's a third Rabio Lepus cameo found at Mao-Mao/Robo Keaton ending. Rabio appears as decoration in Mao's room. - Osaru Station is a merge of the Station Core and the random boss Osaru from the first Aero Fighters. - The F-14's "Bomber Missiles" are recolors of the Pandora rocket from the first Aero Fighters. - It is the first time in the series where the F-14 appeared with the "folded" swing wing configuration. - The sepia images of the second loop ending are flashbacks from the first Aero Fighters opening: Villiam's Harrier, Kohful's AJ-37 and Keith's F-14. - The former F-14 pilot Keith Bishop appears in the Steve-Cindy/Ellen ending as a military trainer. - Another former pilot appears in the Bobby/Robo Keaton and Bobby's ending. Villiam appears to recieve Keaton and Bobby for breakfast, while in Bobby's ending he appears with his wife. - To complete the former pilots nostalgic cameos, Kohful The Viking and Tee-Bee appear in Robo Keaton/Captain Silver ending. - The team-up ending of Keaton and Silver features another cameo: a Rabio Lepus cabinet on Kohful's lab. - The Hi-en/Spanky ending reveals a curious ninja weakness: NINJAS CAN'T SWIM. - This is the first time in the series to feature the "Eject Gag" on Robo Keaton as he ejects his head in two of the endings (Robo Keaton alone and Robo Keaton/Captain Silver team up). - Aero Fighters 2 and Aero Fighters 3 were the reasons which led to many Video System workers to leave the company and form Psikyo. The reason was they thought the company didn't needed to concentrate their efforts on developing for SNK and the Neo-Geo. - The "English version" of all ACA Neo-Geo library is based on the European version, a very clear proof of that is that the game start up lacks of the FBI "Winners don't use drugs" and Parental Advisory Warning screens. I recommend this if you want an Old-school injection to your XBox One, PlayStation 4 and Nintendo Switch or if you had way too enough of First Person Shootouts and racing festivals, sometimes we need to go back to the good old vertical shooting days and this game is a good option. If you're planning to pick this game, then "The Sooner The Better" because i don't know if this game could be kicked out of the stores due to the licensing issues of real aircraft just like what happened to After Burner Climax, where aircraft manufacturers like Boeing and Northrop Grumman behave like "Corporate Divas", i can understand that on car manufacturers like Lamborghini, Ferrari and General Motors, but that doesn't work for Lockheed Martin or Boeing.